There’s a new light on the block from Thrunite, and I weaseled a review unit out of them (just kidding, they sent it willingly!!). I’m excited to have this one, because there’s not a ton of info out there on it yet, and it’s nice to have an early copy! There are two versions, a Neutral White (NW) and a cool white (CW) version. What I have is cool white. $89.95. and probably staying at that price for a while. Except because Thrunite is great, they are throwing out a 20% off coupon for this light!! It is a pre-order, but still… To get 20% off, use coupon code “TC20” before Feb 25th. This is quite a nice little light, and a very great size. It’s also a complete package light, which is usually appreciated. The light ships in a cardboard slip-fit box, which has cutout grip areas. It’s very easy to open. Inside, the light is protected in custom foam, and the accessories are in their own baggie. Thrunite has a big bar code inventory sticker on the front of the package. The manual is a thick, letter(ish) size paper, with four languages printed. It’s a pretty fine manual, with the usual specs and features, but it’s not long on text. I am generally satisfied with the quality of Thrunite lights, and this one is no exception. While it might not be the best ‘fit and finish’ I can’t see a single thing to fault. The anodizing is shiny, and has a nice thick feel. The cooling fins on the head are robust. There’s no cell rattle with the provided cell. One thing I don’t care for – and this is strictly personal preference – is the diamond cut knurling, which is quite aggressive. It provides for great grip on the body of the light, of course, and is useful on the tailcap. But it’s a little rough for my tastes. On the other hand, the threads on the tailcap are great. The body tube is unanodized, but has large, thick square cut threads. The head end of the body has anodized threads, which are also square cut. This does mean the cell tube isn’t reversible. As far as I can tell, the driver is press fit in. And while the bezel thwarted my attempts to unscrew it, I do believe it’s possible with the right tool. Officially 119mm in length x 42mm in head diameter x 33.5mm in tailcap diameter. It’s not a small light, but it’s small for a 26650 light indeed. It’s not small enough that Thrunite saw fit to include a pocket clip, which is a reasonable move on their part. Included is a nylon belt pouch with stretchy sides. The belt loop unfortunately doesn’t have a velcro option, so must be hard-connected to the belt. The pouch holds the light [only] in a bezel-up orientation. Also included is a lanyard, which attaches through a hole in the tailcap. No pocket clip is provided. The Thrunite TC20 is powered by a single 26650 cell, which Thrunite has graciously provided. The cell is installed with the positive terminal toward the head of the light. This is a Thrunite branded cell, but it’s not proprietary. I performed a few runtime tests (more on that in a big). You can see that the light never gets TOO hot (you’ll notice the heat). Turbo and High are very similar in overall profile, except the turbo blip at the beginning of the test. Medium is extremely stable for the duration of the runtime, until the light shuts off. The light does have low voltage protection, which shuts the light off at the (a bit low) ~2.6V (manual says 2.8V). It also has an indicating side switch, which attempts to alert you that the cell voltage is getting low. At 3.3-4.2V, the switch is blue. 2-3.2V, the switch is red. 2.8-3V, flashing red. And below that, the light shuts off. The TC20 also has built in charging, which is done by micro-USB. Thrunite includes a nice cable, which I’d recommend using (over any old random cable you might have lying around). Now why did I do more runtimes than usual? I needed to test charging on the light, and I need empty cells to do that! I had a couple of strange results of very bad charging…. I contacted Thrunite and they suggested a few things. I’ll pass those along later. Here’s the charge graph. This is good charging – Thrunite claims 2A charging, and I’m seeing around 1.8-1.9A for two solid hours. Clean the contacts on the cell and light. Be sure to use a very clean power source, capable of in excess of 2A. If you’re using a power strip like the Anker I have, don’t use any of the other USB ports for anything but the light. Charging will work even if you don’t do these things, but you might not have 2A results, which might be a little frustrating. If you’re the type to leave the light on a charger over night, then none of this will matter anyway. You might charge <2A but it’ll be ready when you need it. This Thrunite has a single side switch, which is an indicating e-switch. As you can see, right in the center is a dot, which can display red and blue. The switch is a standard Thrunite switch. Low action, very positive click, and no squeak. It’s also metal (maaaayyyybe coated plastic, but it feels like real metal). It’s a nice switch! If you’re like me, you’ll make that as a very simple UI. Note how hard it is to get to strobe…. just as things should be. SEVEN POINT EIGHT Amps on Turbo. I can not recall offhand a light that pulled harder than that. I [guess] this is the 6V version of the XHP70.2, so that means this light is working at 48W when on Turbo! The emitter is the up-to-date Cree XHP70.2. It’s at the bottom of a lightly orange peel, shallow reflector. It’d seem like the beam profile would be completely floody, but it’s surprisingly not. 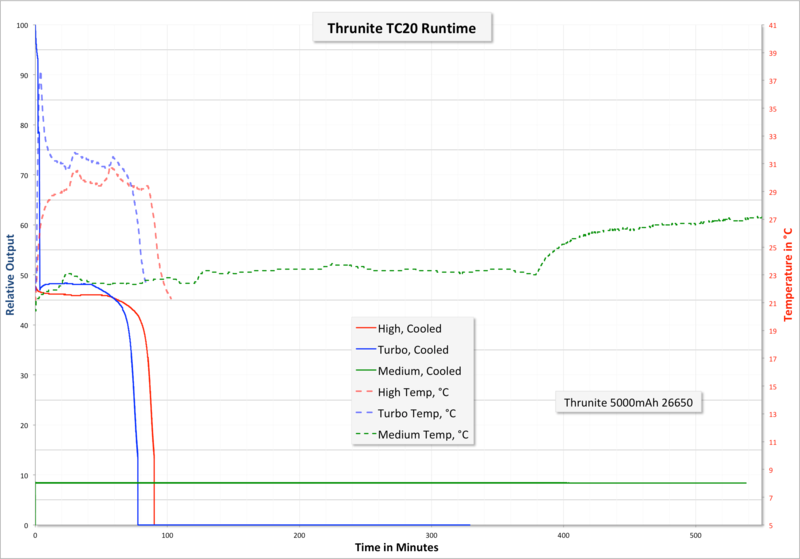 Yes, there’s a fair bit of spill, and no, the hotspot isn’t tight, but the TC20 provides a surprisingly tight hotspot. There really aren’t all that many XHP70.2 lights available yet, and of what is available, nothing compares all that well to the TC20. With the great on-board charging, Thrunite has a nice little light on their hands! UI is quite simple; I might love to see some fleshing out with the indicating switch, and added features there. This light was provided by Thrunite for review. I was not paid to write this review.